View More In Multiparameter Meters. 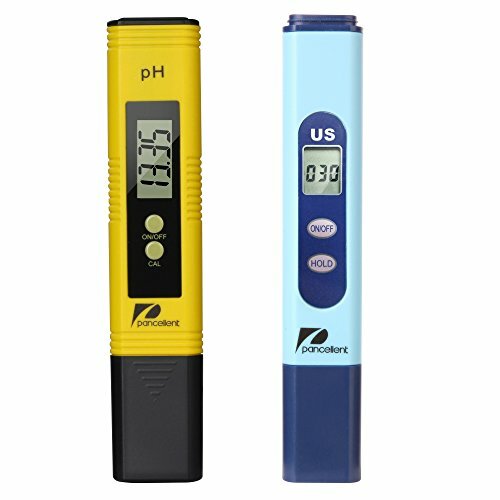 The Pancellent EC PH Meter set is a professional level water test meter. enzyme, chemical experiment, ionized water, PH value of human urine and so on. Lock function - makes it easy to read and record, press HOLD button then remove from test solution. 10 minute Auto Shut Off feature, so battery won't run down. Automatic temperature compensation: can automatically change the value of the value of 25 ℃. [ Convenience Use ] 5 Seconds know water quality, Accuracy, Faster. This set Combo of TDS PH. Also it have Best Price, Trustable Quality, all make it be your choose of water quality Test. [ How Accuracy? ] PH resolution is 0.01pH,accuracy ±0.01pH. Electrical Conductivity Rang:0~9990us/cm, ±2% accuracy .This's same as big brand resolution in Amazon, but Pancellent tester only need half price of them. [ Lasted Model ] PH pen have AUTO CALIBRATION function, not need any kind of screwdrivers to calibrate the pH pen tester. EC pen have Lock & auto shut off function. If you have any questions about this product by Pancellent, contact us by completing and submitting the form below. If you are looking for a specif part number, please include it with your message.